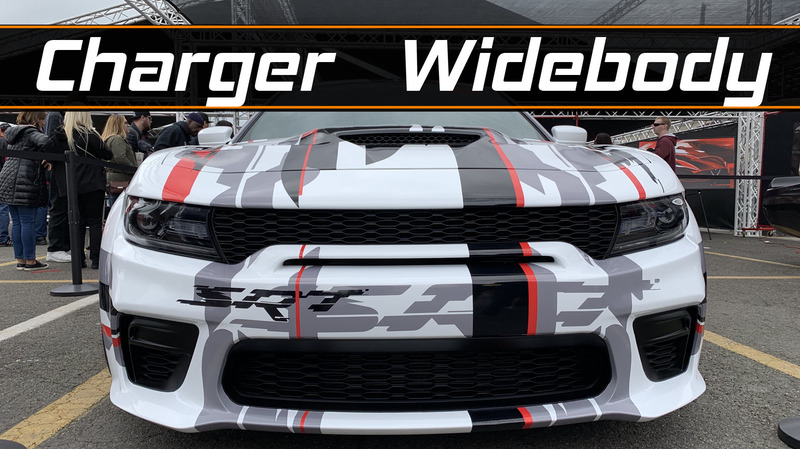 In the opening of the video you can see the new Charger Widebody concept which is masked with a geometric wrap to hide the shape, but you can still get a good view of the design. Sporting 20 x 11” wheels that look similar to the Daytona wheels wrapped in 305/35/20 tires. You can see quite a few other design changes in this version of the car. These changes include Fender Flairs (obviously) with the side markers molded in. The front features a jeep SRT / Durango style slot above the bumper shortening the upper grill then below the bumper you will find much larger fog Light area vents. In the rear there are some subtle changes to the vents and you will see the spoiler has been extended quite nicely. I’m not sure what to think, I would have loved to see it in a solid color to better understand the design… Time till tell if this will make the jump to a production car in 2020. Due to the music played at the event most of the audio needed to be replaced with non-copyright music, all the tracks be found below for your enjoyment. We do cut in and out with live audio at time. In the next week or so I will be posting more video from the days leading up to the event, including the disassembly of a few hour old Hellcat Redeye to modify to for the event.